(MOMA), New York, my photo. The text in the lower part has something to do with body temperature. Clicking on the image makes it bigger. A few weeks ago I watched a video about Joseph Beuys on YouTube, "I Like America and America Likes Me" (link in an earlier post). It consists of extracts of a famous performance, with some commentary and other video clips spliced in, a 16-minute mini-documentary. 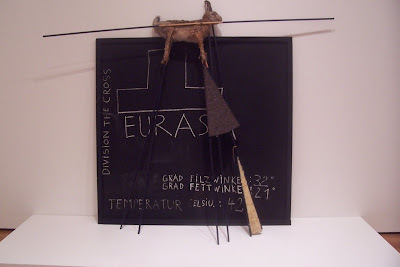 I had also seen the "Eurasia" installation in MoMA and was drawn to it. I don't know what it is about Beuys. Maybe it's Benjamin's "aura". I think it has to do with his gentle attitude to animals; he projects a genuine positive attitude towards everyone, live and let live. It's a sort of political art. I can respect this sort of performance (the coyote) -- the bits shown on the video were quite powerful. It means something, I don't know what, it's just moving in some way. The way the coyote tried to engage him. I can't get my mind around that. It makes me think that solitary confinement must be very cruel. It makes me think of ancient times, before technology. "831. The line! My lines of 1906/07 were my most personal possession. And yet I had to interrupt them, they are threatened by some kind of cramp, perhaps even by finally becoming ornamental. In short, I was frightened and stopped, although they were deeply embedded in my emotions. The trouble was that I just couldn't make them come out. And I could not see them around me, the accord between inside and outside was so hard to achieve. The changeover was complete: in the summer of 1907 . . . "